Style and individuality is why you own the car you do! 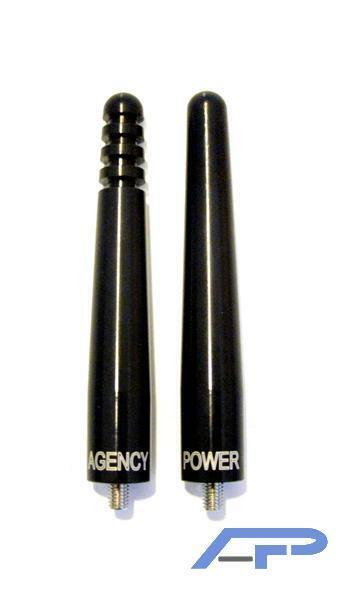 Agency Power has released these 2 different styles of shorty antennas to fit your 2008 and up vehicle. These antennas fit vehicles such as the Subaru WRX/STI, Scion XB/XD, and other models with this newer style rear antenna mount. The all CNC machined aluminum antenna is anodized black with the Agency Power name laser engraved at the base. A new steel set screw is provided to allow easy replacement of the factory unit. The antenna is approximately 3 in in length and inch in diameter. The bottom is beveled for a flush fit. Long term testing has shown no effects with the vehicles radio reception from the shorter length and aluminum material. Antennas are available in the solid or fin style design. This is for purchase of the Solid version of the antenna. Excellent payment options and no hassle. I ordered a universal Hurst Pistol Grip "shift knob" for my '12 Mustang GT. It squeezed to a perfect fit right where I need to grip it. It improved shift time and accuracy greatly and feels and looks great! Autoplicity had the best price on the web and I got this in 3 business days. I recommend this product.